How Do I Lose Weight When Nothing Works? A critical aspect of a healthy diet is to consume fats, proteins and carbohydrates in the right proportions. All three of these nutrients supply energy for the body and help build and repair cells. Conversely, eating too much of any of these three energy sources can be detrimental to your health. For example, too many carbohydrates in your diet predisposes you to type 2 diabetes, whereas a high-fat diet is linked to atherosclerosis. By keeping track of how many fats, proteins and carbohydrates you eat each day, you can make sure you are eating these substances in the right amounts. Set targets for fat, protein and carbohydrate intake. A balanced diet will consist of between 20 to 35 percent calories from fat, 10 to 35 percent from protein and 45 to 65 percent from carbohydrates, the Institute of Medicine states. Aiming for 30 percent, 20 percent and 50 percent of your calories from fat, protein and carbohydrates, respectively, will meet these guidelines. Convert calorie targets into grams of fat, protein and carbohydrates. For a 2,000 calorie diet and the desired 30/20/50 distribution, this amounts to 600 calories from fat, 400 from protein and 1,000 from carbohydrates. Each gram of fat contains 9 calories, so this amounts to approximately 67 grams of fat per day. Protein and carbohydrates contain 4 calories per gram, so this plan allots 100 grams of protein and 250 grams of carbohydrates. Look up the nutrition information for all of the foods you eat. According to the American Diabetes Association, you can use nutrition labels to measure carbohydrate content. Nutrition labels also contain information about the amount of fat and protein in each serving of food. If you cannot find a nutrition label for a food item, you can use an online database, such as the USDA National Nutrient Database, to find the information. Measure the number of servings of each food item you consume. 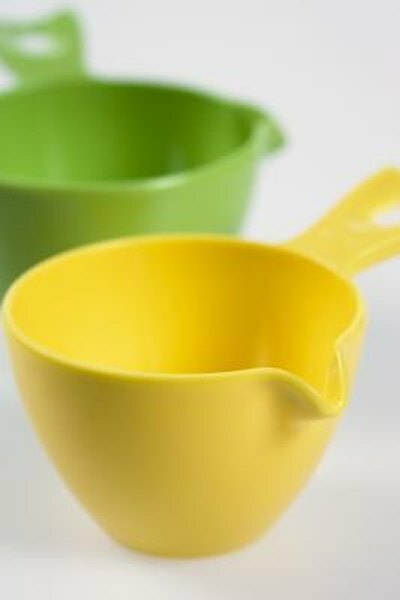 Use measuring cups or a scale to calculate how many servings of each food item you consume. Multiply the amount of fat, protein and carbohydrates in one serving of every food item you consume by the number of servings you ate.